Quiet day in the classroom on Thursday as students plowed away through their inks. A few stayed at home or only came in for part of the day so the room looked pretty deserted at times. Here are a few pages we haven’t seen much of yet since Stephanie has been doing a lot of work at home. Her story—which ended up being 12 pages long—is about a zombie cheerleader character of hers (the cover threatens copyright violators with having their brains eaten), who find herself being followed around by a pack of… chickens? Read the mini and you’ll find out why! Jessica got students thinking about the last major step of this class: making a minicomic. 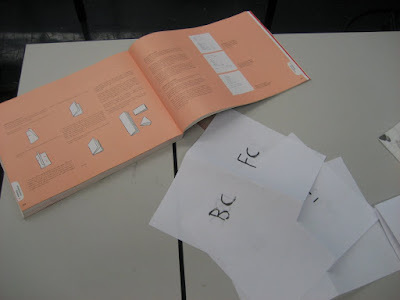 First she reviewed the minicomics appendix in DWWP and had everyone make imposition guides (which help you figure out what order to paste up your pages). Some people will be doing their layout on computer but it still helps to do this part manually so you can visualize what your book will look and feel like. We also have a large pile of minicomics spread around the room which people have been studying for format ideas, materials, cover designs, and so on. Tomorrow’s the last day! Jessica will show up in the morning and I’ll join her at mid-day for a wrap up of the class. Then as a special treat, David Mazzucchelli will be giving us a quick tour of his new show at MoCCA and then will do a final critique of everyone’s stories and minicomics layouts.